Line-of-Sight Antitank (LOSAT) Weapon System consists of Kinetic Energy Missiles (KEM) and a second-generation FLIR/video acquisition sensor mounted on an air-mobile, heavy HMMWV chassis. 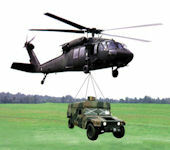 LOSAT is mounted on a modified HMMWV vehicle and is accompanied by a wheeled re-supply vehicle. The system is fully transportable by C-17, C-130, C-141 and C-5 aircraft, as well as the CH-47 helicopter and can be sling-loaded under the UH-60L helicopter. The Line of Sight Antitank is a dedicated antitank weapon system capable of providing a high volume of accurate fires at ranges exceeding those of current tank main guns. The LOSAT Weapon System consists of an encased missile, missile shipping and storage containers, Fire Unit, support structure, reload system, Electro-Optical System (EOS), Target Acquisition System (TAS), Fire Control System (FCS) and Pulsed Laser System (PLS). The LOSAT will be mounted on an armament carrier, HMMWV (M1113), will have a three man crew, and carry four ready to fire Kinetic Energy Missiles (KEM). The KEM, a long rod tungsten penetrator, accelerates up to 5000 feet per second and has five times the kinetic energy of current tank rounds. Time of flight to maximum range is less than five seconds. The Fire Control system (FCS) allows the gunner to acquire and track up to two targets simultaneously and engage them in rapid sequential fires. Once the gunner issues launch consent, the system automatically guides the missiles to the target. The gunner is assisted by the FCS, which tracks the missile to the target. The LOSAT also features controls and displays along with digital communications compatible with the Force XXI Battle Command Brigade and Below (FBCB2) System. The LOSAT can operate autonomously or on conjunction with other systems through FBCB2 or FM communications. 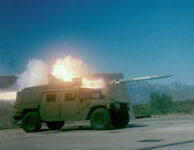 The LOSAT Weapon System provides the gunner the capability to recognize a target beyond the maximum effective range of the current TOW missiles, and will incorporate the following capabilities: embedded built in test/built in test equipment, automatic boresight, self defense weapons, and room for growth. The missile accelerates to 5000 feet per second, flies to maximum range in less than four seconds and delivers five times the kinetic energy of current tank rounds. The fire control system allows the gunner/commander to acquire and auto-track up to three targets. Once a launch consent is issued, the system automatically initializes and guides the missiles to the targets in a sequential manner. Range of the LOSAT missile is about 5 km. The Kinetic Energy Missile weighs 174 pounds, is 113 inches long and 6.4 inches in diameter. The current system provides for a three-man crew, but a crew of two can also conduct engagements. With a missile speed of 5,000 feet per second, it reaches maximum range in less than five seconds. The LOSAT missile is a hit-to-kill missile with no explosive warhead. It carries a long-rod penetrator and destroys the target through the application of brute force. The KEM, which can travel up to about 5,000 feet per second, relies on its impact force - rather than a warhead- to destroy its target. A Forward-Looking Infrared acquisition sensor on the vehicle is used to guide the KEM to the target. The system utilizes a Heavy High Mobility Multipurpose Wheeled Vehicle (HMMWV) heavy chassis, hypervelocity kinetic energy missiles (KEM), a second generation forward-looking infrared (FLIR/TV) acquisition sensor and has a crew of two. The LOSAT system consists of a Humvee armed with four ready-to-fire missiles, with eight missiles towed behind in a resupply trailer. The LOSAT System carries four ready missiles via two two-pack containers. LOSAT can operate autonomously or with other systems using its digitized Command and Control capability. The Army will mount LOSAT on a High Mobility Multi-Purpose Wheeled Vehicle (HMMWV) chassis, as a supplemental anti-armor capability for light divisions equipped with tube-launch optically-controlled wire-guided and Javelin anti-tank systems. The basic organizational unit for LOSAT will be a five-man squad equipped with two HMMWVs and a high-mobility missile resupply trailer. One HMMWV, called the Fire Unit (FU), will be the LOSAT missile launch vehicle and will carry four ready-to-fire missiles. The fire control system in the FU is based on the Improved Bradley Acquisition System, which features an acquisition system using a second-generation forward-looking infrared sensor and a daylight TV. 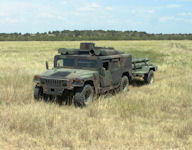 The resupply HMMWV will tow the resupply trailer, which will carry eight additional missiles. The system will be deployable by strategic and tactical airlift (C-5, C-17, C-130) and external air transport (via UH-60L and CH-47 helicopters). The LOSAT program started an Army ACAT I system with oversight by DOT&E. In 1992, analysis by the Army caused the program to be reduced to a Technology Demonstration. The program was upgraded by the JROC to an Advanced Concept Technology Demonstration (ACTD) (4QFY97). Initially, LOSAT was to be mounted on an extended length Bradley Fighting Vehicle. 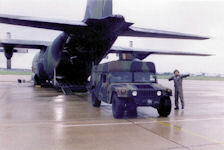 As a Technology Demonstration it was to be mounted on an Armored Gun System (AGS) chassis but when the AGS program was canceled, LOSAT was reconfigured to a HMMWV chassis. Developmental testing has been conducted using the fire control system to direct the kinetic energy missile at tank targets. Testing at White Sands Missile Range, NM examined the launch effects of the LOSAT on an expanded-capacity HMMWV. Under developmental test conditions, the missile is capable of defeating any known tank it hits. 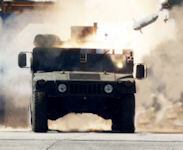 Test firing of the LOSAT missile in a non-tactical configuration on top of a HMMWV has shown all launch effects to fall within the Army's acceptable ranges for human factor limits. Data gathered were extensive both inside and outside of the vehicle. Measurements were made of shock and g-load, on crash test dummies, and flash, toxic gases, pressure, and sound in and outside the vehicle. Numerous operational performance issues must be addressed in future testing - either within the ACTD or in subsequent formal OT&E covered by a TEMP. In August 2002 Lockheed Martin received a contract for the first production lot of tactical Line-of-Sight Antitank (LOSAT) Weapon System missiles. The $9.3 million contract represents the first production run of the extremely powerful Kinetic Energy Missile (KEM), which is fired from the LOSAT vehicle. Lockheed Martin Missiles and Fire Control is the prime contractor on the LOSAT program. The U.S. Army Aviation & Missile Command, Huntsville, Ala., is the contracting agency. Delivery of the missiles will be completed by July 2004. These 108 missiles will be used to equip the first tactical LOSAT unit, A Company of the 5-11th Parachute Infantry Regiment. According to the FY03 DOT&E report, the kinetic energy missile is lethal when it hits its intended target. Live missile firings in DT established the missile's ability to hit and destroy a reinforced urban structure and a moving tank at relatively close range off-angle. Test firings against more challenging targets (e.g., evasively moving and multiple targets) and under more demanding conditions (e.g., extreme environments and countermeasures) remain. The DOT&E also staes that the survivability of the overall system is an issue. The Program Manager chose to trade some ballistic protection for enhanced deployability (to ensure that the LOSAT system remains sling-loadable from a UH-60L helicopter). The LFT&E program will assess the degree to which the LOSAT system, including the missile, both HMMWV vehicles, and the loaded trailer, is vulnerable to the expected threats. This program describes critical vulnerability and lethality issues and the scope of testing needed to address them, including the need for more than one FU for full-up, system-level LFT&E to support the planned full-rate production decision.